For the first time that this writer can remember, a major political party is going into a federal election with a policy which, on its face, is designed to reduce the rate of increase of residential rents, allowing tenants' incomes to catch up with rents. The Australian Labor Party is proposing to allow full deductibility of negative gearing only for new homes, from mid 2017. Properties acquired before that date would be grandfathered — that is, they would remain subject to the old rules, in order to avoid any forced sales of existing investments or other disruptions of existing leases. The stated intention is that the new conditions on negative gearing would direct demand from future investors towards new homes, inducing new construction, or helping builders to sell their newly built stock so that they can move on to further construction. The ensuing higher rate of construction would create employment and, over time, increase the stock of housing relative to population, allowing rental vacancy rates to increase. This trend, when superimposed on the background trend of rising rents, would lead to a reduced rate of rental growth (but not necessarily a fall in rents). The Real Estate Institute of Australia (REIA) has littered our letterboxes with a set of flyers (here's a backup copy) claiming that “the planned changes to negative gearing” would raise rents by up to 10%, but somehow simultaneously reduce prices (thereby devaluing your superannuation), that they would lose more government revenue than they would save, and that they would cause unemployment and threaten the whole economy. No reasons are given. No sources are cited. There are five slightly different flyers: one for tenants, one for sellers, one for landlords, one for buyers, and a generic one for “you”. The last one includes the further claim that the fall in prices won't be enough to “make it much easier to put together a 20% deposit on a first home.” Curiously, the versions addressed to sellers, landlords and buyers omit the claim that rents would rise. It is not clear whether this is because the targeted readers wouldn't mind that bit, or because they wouldn't believe it. As the REIA does not give reasons why Labor's policy would allegedly raise rents, we must try to infer the reasons from other sources. And while the REIA does not cite any sources, its claims are remarkably similar to those contained in the much-criticized BIS Shrapnel report on negative gearing, which was released with much fanfare in the Murdoch press in early March, three weeks after Labor's policy announcement. It later emerged that the report was completed seven months before the announcement, and promptly sent to Labor staffers by Bongiorno & Partners, who commissioned it. I shall cite that report extensively. Putting aside the apparent conflict between rising rents and falling values, we seem to have two arguments from the PM. The first argument is that there would be fewer rentable properties. Because only future investors in established homes would lose negative gearing, the PM seems to be claiming that the reduced rate of acquisition of established homes by investors would reduce the supply of rental homes and therefore increase rents. If that is indeed what he means, it is an incredibly crude fallacy: it assumes that if an established home for sale is not bought or retained by an investor, it will vanish into thin air. In real life, of course, if an established home for sale is not bought or retained by an investor, it will be bought or retained by an owner-occupant household, so that one home and one household are taken off the rental market. Thus the reduction in the supply of rentable homes will be offset by the reduction in demand, leaving no reason for any increase in rents. The only landlords who have higher costs — namely future investors who are affected by the new incentives but choose to ignore them — will be able to carry forward their losses and claim them against later positive cash flow. Moreover, the few landlords who do have higher costs will be in competition with those who don't, and therefore won't be able to pass on the higher costs unless competition among landlords is reduced. But the object of Labor's policy is to increase competition among landlords by stimulating new construction! It is therefore a fallacy to argue, as Turnbull apparently does, that landlords will charge more rent simply because their costs rise. The same elementary fallacy was repeated in an article in the Fairfax dailies by former Senator Bill O'Chee. Negative gearing would still apply to fresh investment in new dwellings. However... When you later came to sell a property..., the next owner won't qualify for negative gearing — and therefore you would not be able to sell it without taking a price fall. Moreover, new dwellings are more expensive and many would-be investors will face a price barrier. Resales to owner-occupants — which make up the majority of resales — won't be affected, because owner-occupants already can't claim negative gearing. Resales to positively geared investors won't be affected. Resales to negatively geared investors won't be affected if the investors have other investment income against which they can claim their losses. The non-transferability of the right to claim negative gearing reduces the market value of that right, but not to zero (otherwise nobody would buy a non-transferable train ticket). If the “discouraged investor effect” were real, the same mechanism would have impeded construction through a “discouraged first-home buyer” effect. Since late 2012, the States and Territories have concentrated Federally-funded first home owners' grants on new homes. If you buy a new home with the aid of a grant, you can no longer sell it to another first home buyer who gets the same grant! Has this policy been followed by a slump in construction? On the contrary, construction has increased (see the graph below); and according to the latest chart pack from CoreLogic, the year-on-year change in rents for Australia's combined capital cities has been falling since mid 2013. Perhaps someone will say that we can't compare investors with first-home buyers, or that we must also consider foreign investors when explaining the ramp-up in construction. Very well. Foreign investors in Australian residential property are obliged to invest in new dwellings. Hence they can't re-sell those dwellings to other foreign investors. This, according to BIS Shrapnel's logic, should have caused a “discouraged foreign investor effect”. But, while there is much commentary about the present policy causing a glut of high-rise apartments, which the owners are not obliged to offer for rent, I haven't heard a word about foreign investors being “discouraged” by the inability to re-sell their properties to other foreign investors. But the acid test is this: If the “discouraged investor effect” were real, it would have applied with far greater force while negative gearing was quarantined from July 1985 to September 1987. During that period, if you bought a new home as an investment, not only could you not re-sell the right to claim negative gearing on it; you didn't even have that right yourself! So, what happened between 1985 and 1987? As even the BIS Shrapnel report admits, “In broad terms, neither rents nor dwelling prices displayed any notable change of behaviour or deviation from trend during 1985–1987” (p.30). If we plot real (inflation-adjusted) changes in rent in the five big cities, we find that during the period in question, real rents clearly fell in Brisbane and Adelaide, rose marginally in Melbourne, and rose clearly in Sydney and Perth (first graph at ABC Fact Check). If rents rose due to suspension of negative gearing, one would expect the effect to be national, not local. Moreover, the two cities in which real rents significantly rose were those in which vacancy rates were already tight (third graph), notwithstanding the alleged benefit of previous negative gearing. As repeatedly explained at MacroBusiness, if you plot the real year-on-year change in rent for the combined capital cities over the last four decades, there is nothing special about the period during which negative gearing was quarantined; real rents rose faster at other times before and after that period. The graphs for individual cities vary wildly from the national graph; there is no uniformity of behaviour around the period in question. If this is the “discouraged investor effect” when even the buyers of new homes can't claim negative gearing, the corresponding effect when they can claim it (but are merely prevented from re-selling that right) is not a suitable subject for a scare campaign — unless perhaps your intended audience is scared that rents might fall, or not rise as fast as they otherwise would! At this point, someone will say that the two-year quarantining of negative gearing was not long enough for the effect to show up in rents, and that we need to look at the rate of construction. Very well. The upper curve in the following graph shows quarterly private-sector dwelling commencements, seasonally adjusted (ABS 8752.0, Table 33). The lower curve shows the “indicator” standard variable mortgage rate (RBA Series ID FILRHLBVS, for the middle month of each quarter). Below that are three bars showing time periods of interest (with accuracy limited by the time resolution of the spreadsheet on which the graph is based). 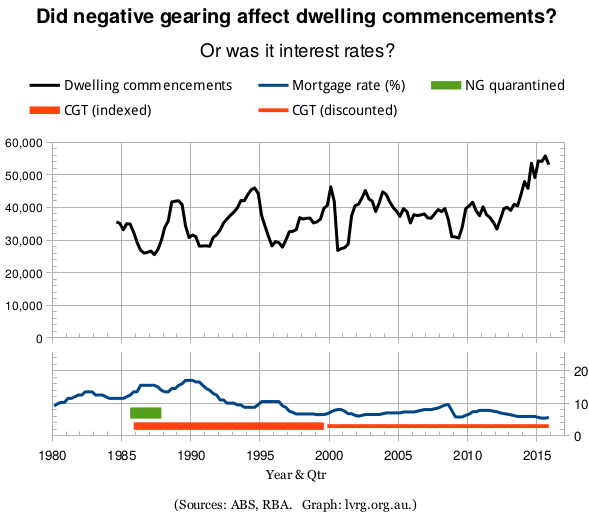 The green bar shows the period of quarantining of negative gearing (July 1985 through September 1987). The wide orange bar shows the period of the inflation-adjusted capital-gains tax (September 1985 to September 1999), and the narrower orange bar shows the period of the 50% capital-gains discount (September 1999 to present). There were six major declines in construction, bottoming out in 1986-7, 1990-91, 1995-6, 2000, 2009 and 2012. All six closely followed, or were simultaneous with, rises in interest rates. Only the first was correlated with the quarantining of negative gearing, and it was not noticeably worse than the others (whether or not we consider that the figures are not scaled to population or any other measure of the size of the economy). The first decline-and-recovery of construction was further assisted by the stock-market bubble, which attracted funds away from property, and the ensuing crash of '87, which caused a flight back to property. I conclude that the first building slump is more than adequately explained by interest rates and other factors, and that there is no need to invoke the quarantining of negative gearing or the introduction of the capital-gains tax. Neither do we need to invoke the discounting of capital gains in order to explain the pre-GST construction spike of 1999-2000. There was a frenzy of activity to “beat the GST”, followed by a post-GST slump, which the Howard government deliberately relieved by offering a temporary supplement to the First Home Owners' Grant — for new homes only! Similarly, the Rudd governments's First Home Owners' Boost, which again was more generous for new homes than for established homes, was a deliberate and apparently successful attempt to induce a construction recovery in 2009. I note in passing that, in a low-inflation setting, Labor's companion policy of reducing the capital-gains discount from 50% to 25%, thereby increasing the effective taxation of capital gains, would be a rough approximation to returning to the former policy of adjusting the cost base for inflation but not discounting the gains. The former policy, as the graph shows, was compatible with historically high levels of construction in the late '80s and mid '90s, although the economy was smaller then than it is now. This may be because a capital-gains tax, by default, increases the attractiveness of current income relative to capital gains and therefore encourages land owners to generate income from their land — e.g. by building houses on it. In summary, although investors in new homes during the quarantining of negative gearing could neither resell the right to claim negative gearing nor use it themselves, the above graph and its surrounding history offer no evidence that this policy caused a slump in construction. Hence, by comparison, it would seem that allowing investors in new homes to claim negative gearing, but not to re-sell the negative-gearing right, would cause an increase in construction. Which just happens to be the stated aim of the policy. I conclude that the “discouraged investor effect” is a myth. But I also concede that it is less ridiculous, and therefore more pernicious, than the pretense that negative-gearers need to take established homes from owner-occupants in order to keep a lid on rents. I now briefly consider the other claims contained in the REIA flyers and apparently based on the BIS Shrapnel report. While the report says that home prices will fall, it does not actually attribute the fall to the restriction of negative gearing. Rather, it predicts that the policy would cause prices to increase more slowly than the base case (no policy change), but even the base case includes a period in which the increase is negative, due to an expected price correction (pp. 11,13). I agree that limiting negative gearing to new homes would reduce the rate of increase of prices — except that, whereas BIS Shrapnel apparently attributes the effect to discouraged investors influencing prices and rents in opposite directions, I attribute it to an increase in construction influencing prices and rents in the same direction. I would also note that the increase in construction and associated economic activity would lead to higher spending power, which in turn would tend to support prices in the short term. On the other hand, home buyers wishing to buy established homes would suddenly no longer have to compete with negative-gearers. Grandfathered negative-gearers would be reluctant to sell; but their numbers would decline as their properties became positively geared over time. These considerations also point to a reduction in the rate of increase of prices. The report says that limiting negative gearing to new homes would reduce total revenue. But this conclusion depends on a reduction in receipts of income-tax, GST and stamp duty due to the decline in construction. Having discredited the premise that the policy would cause a decline in construction, I reject the conclusion that it would reduce revenue. Similarly, the report predicts higher unemployment and lower GDP because of less construction, hence less activity in industries upstream and downstream of construction. Again, having discredited the premise, I reject the conclusion. If you're a property investor, you stand to lose from any policy that would reduce rents or reduce the rate of rental growth. If you work for property investors, part of your job is to oppose any such policy. But, in campaigning against the policy, you can't advertise your real reason for opposing it. If you openly argue that the poorest one-third of the population should be milked for as much rent as possible, you might provoke a backlash, including from some people whose prosperity depends on milking the poor for as much rent as possible, and who can live with that fact only as long as it is not articulated too clearly. So you have to claim that the policy would raise rents, even if that claim is counter-intuitive; and you have to profess concern for the tenants, even if such concern is contrary to your business model or your mission statement. If, on the contrary, the policy really would raise rents, property investors and their representatives would have reason to support it, not oppose it. But again, they could not advertise their real reason for supporting it. Their best bet would be to hold their peace, or, at most, to find some other excuse to support the party proposing the policy — not to campaign against that party. So clearly the REIA, which represents real-estate agents, who work for landlords and property sellers, is coming from behind when it attacks Labor's policy by claiming that it would raise rents. But let us ignore all that. Let us assume that the REIA, if confronted by a policy that would help its clients, would be capable not merely of holding its peace, but of actively attacking the policy because of its unfairness to people who are not its clients. Let us consider only the substance of its claims. Then the claims don't stack up. * Personal explanation: Allowing negative gearing only for new homes was recommended by the Acting Premier of WA in 1987; but, to my embarrassment, I did not know this until 2015. I independently started advocating the same policy in 2003. As recently as May 2014 [same article], I entertained the hope that the Abbott government would implement that policy in its first Budget. Only in April 2015 did it become apparent that a Labor government would be more likely to do so. Meanwhile the problem of “speculative vacancies” — dwellings that are neither occupied nor available for rent — was first brought to my attention by Karl Fitzgerald at Prosper Australia in 2008. Before that, I acknowledged the merit of encouraging owners of habitable properties to try harder to attract tenants, was not aware of the large number who were not even pretending to try.